On July 1st, I’ll be having a kinda major surgery: a laparoscopic hysterectomy and bilateral salpingo-oophorectomy. Okay. Typing that was the hard part. Most of you know that I’ve lived with a debilitating medical condition which has become increasingly difficult to live with–endometriosis. You may not know that most of my pain actually comes from a sister-condition called adenomyosis. These conditions mean that my body has cell growth in places it shouldn’t (endo, all throughout the abdominal cavity; adeno, within the musculature of the uterine walls). I’m sure this sounds boring. I’m not getting this out the way I’d hoped. I’d wanted to write something funny and irreverent about kicking my wicked reproductive organs to the curb, but it’s a complicated thing. I work with one of the world’s best endo doctors, which is why I have finally decided to take this chance. Even though my pain is linked to my periods, hysterectomy does NOT cure endo. Most women who have hysterectomies to cure endo are crushed when their pain comes back. The only reason this is a good option for me and my body is because of the presence of that sister-condition, adeno. It means that the removal of *my* uterus might actually help. So on July 1st, it’s coming out. I am a person who deals with life through connection with other people. I recognize that it might seem weird that I’m posting about this online, but hey–that’s me. That’s what I need in order to be okay with all of the things I’ve got in my head. I’m posting about this because I need to be able to share this information with my friends and family. And I want to be able to blog about my feelings and my experiences and know that someone else might be comforted some day to read that I lived through the same pain they’re dealing with. 3. I’ve had the BEST time being a Jamberry consultant for the past year. I’ve made some great friends and great cash selling nail stickers that I LOVE. But priorities change. So, I’m hosting my last Jamberry party too. If you’d like to place an order, you can by visiting kelsnotchels.jamberry.com. I’ll be selling my personal back stock in the garage sale link above too. Your thoughts and prayers mean the most though, so please keep those coming. I’ve recently named my uterus “Felicia.” And now it’s time to say BYE. For almost twenty years, I have lived with pain. As a teen, that pain came each month, and lasted two or three days. I would have a hard time getting out of bed, or I’d be unable to go out with friends, or I’d pass out in front of Nordstrom at the mall and my mom would go buy me a peanut butter pretzel to help with my “blood sugar”. I didn’t know it wasn’t normal. I told my doctor about it, and he routinely made me feel many shades of stupid. He’d tell me–at fifteen years old–that once I grew up and got pregnant, all that pain would go away. Even at sixteen, I told him I didn’t foresee motherhood. At one point, I even asked him if hysterectomy was possible. He told me it wasn’t… not just because I was “too young” but because I’d change my mind. I was too young to know what I’d want in the future. Of course there was a possibility he’d be right. Of course, as it turns out, he wasn’t. But he wasn’t the last. I was young, and I didn’t know what was or wasn’t okay in regards to how a doctor interacts with a patient. I didn’t realize at the time that I should have been standing up for myself more fervently. It was over a decade–at least–before anyone mentioned the word “endometriosis” to me. I can’t even be totally sure how I put the pieces together in the end, but I know it wasn’t because a doctor helped me do it. I’m sure it came about from some combination of searching Dr. Internet, ruling out imminent death, and giving myself a diagnosis. I started to look for doctors who specialize in the condition feeling sure I’d fly myself across the world to see one, if that’s what it took. Even then, when my condition created only about 3-5 bad days each month, I felt like my life was being sacrificed to a brutal deity and was ready to demand the care I deserved. I cried when I discovered a world-renowned endo specialist in Texas–four minutes from my house. When I met with him for the first time, my walls were sky high. I entered with a chip on my shoulder and bile in my mouth. I was ready to defend myself against accusations of lying for pain meds and time off work. I was confused. Uhhh, my pain was about my period. No uterus, no period, no pain. I was so wrong. He taught me a lot that day, and then my little research train brain took off on its own and I began to seriously study the disease. I learned that endo is when cells similar to those in my uterine lining grow in places outside my uterus. I learned that if I had endo, it wasn’t in my uterus–that’s the whole problem. It might be on my ovaries, on my abdominal wall, on my intestines, behind my bladder, or any number of other places inside my body. Taking out my uterus would stop my period, and it might stop some pain, but it wouldn’t necessarily stop pain caused by endometriosis. ‘Cause that’s not where it lives. We started going through tests, brainstorming options, developing a plan, and shortly after, we decided to do a laparoscopic procedure which would 1) confirm the presence of the disease (which does not appear on scans) and 2) remove the endometriosis cells from any place he was able to find it. My surgery was scheduled for November. I was frightened, but optimistic. He was going to remove this disease. I was going to be cured. To read part 2 of my journey, click here. 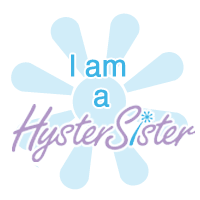 On July 1, I’ll be undergoing a radical hysterectomy–that means they’re taking all of it and all of its friends too. Ovaries. Tubes. Cervix. I’m nervous, sure. But I’m feeling more and more okay about it every day. Part of that process for me is sharing about it, and I’ve dusted off this old blog as a place to do that.